If Audi built its original Quattro today, it would be the all-new 2019 Audi Q8. Now, half of you are screaming with internet-rage. Others are nodding along approvingly. 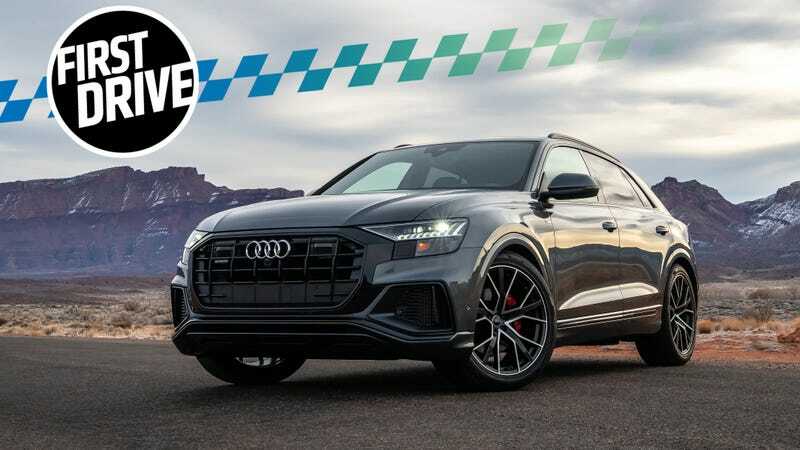 That’s the polarizing beauty of a “hot take,” and the 2019 Audi Q8 is the automotive equivalent. And I think it’s as close as you’d get to a modern iteration of the Ur Quattro, both through its stylistic link to the past, and the fact that you can actually go out and fling it around off the beaten path. 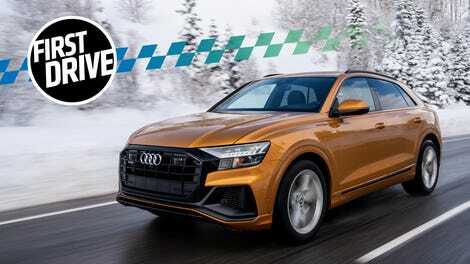 How the hell can a squashed Q7 be anything close to resembling the legendary Ur Quattro? It’s all in the lines here. See the blister flares. Those hark back to the boxed fenders of the original rally coupe. That D-pillar of the Q8 is nearly the same raked angle and shape as the OG Audi. There’s also a bit of black trim sitting below the full-length taillights of the Q8, yet another design homage to Audi’s old-school icon. Now factor in the notion that automakers are currently obsessed with crossovers. If Audi were to pull an original Quattro out of the ether today, this is how it would appear. Not as pumped up RS5, not as the TT RS... but here, as a sporty crossover. This exercise in form and function is very similar to what Audi already offers with its A6 and A7. Here it’s applied to a much hotter-selling segment, of course. Crossovers accounted for nearly 60 percent of all Audi sales in America in 2018. That number is going to rise, too, as the Q3, eTron, and this Q8 are ready to satiate the desires of our wagon hating car-buying public. Thankfully though, Audi isn’t stepping into that mind-numbing space where every automaker wants to present any vehicle with a sloped roofline as a “coupe.” This is a performance-minded crossover that focuses on delivering enjoyable driving dynamics, top-flight interior tech, and a bit of look-at-me design on the outside. All without cutting into interior comfort and actual usable utility. Behind that broad snout lives a 3.0-liter turbocharged V6 engine. Audi claims it cranks out 335 horsepower and 369 lb-ft of torque, and its partner in powertrain crime is an eight-speed automatic gearbox. It all flows smoothly with a 48-volt mild-hybrid system. In fact, you can barely feel the Start/Stop setup kick the vehicle to life when the light turns green. The Q8 sends power out to all four wheels through its quattro all-wheel drive system, and this one is of the rear-biased variety. In standard driving modes, the torque split is 40:60. That power split can be sent further to the fun side if you’re in Dynamic mode and have traction control set to ESC Sport. Up to an 85 percent rear bias, in fact. But as far as fun-having, unlike its rally car forefathers, the Q8 is no featherweight. We’re dealing with something that weighs around 5,000 pounds. The dash from 0-60 mph should occur in the low to mid five-second range. But while you’re out there hustling, the Q8 responds far more quickly than you might expect. An adaptive suspension system is fitted as standard equipment. It provides for a surprisingly flat cornering experience when you put the car into its Dynamic mode. There’s an optional air suspension system, but that likely won’t corner quite as calmly. It does offer two more drive modes (off-road focused), and rear-axle steering. We tripped from Utah to Colorado and a third of that time was spent off paved roads. Dirt, mud, and snow conspired to put a set of oversized 22-inch wheels into a ditch or a rock. That never happened. The Q8 marches forward in a confidence inspiring manner. In fact, DSC Sport was engaged, the throttle and my sneaker bottom made love, and dusty corners were dispatched in a rally inspired manner. And with none of the turbo lag you’d find if you might be fortunate enough to push an Ur Quattro on these same trails. Audi’s fully digital gauge cluster is a nice high-tech centerpiece for this vehicle’s interior, and the whole cockpit feels intuitive and expensive. The Q8 features a dual-screened center section showcasing crisp displays and smartphone-like behavior. It seems like automakers are finally learning that they shouldn’t try to beat smartphone UIs and controls, but learn from them and adapt them into the in-car environment. That’s how the latest generation of Audi’s MMI infotainment responds to swipes, pinches, and double taps just like you would expect it to. Other cars do this too, but it feels the extremely polished here. There are no delays; Only intended actions. Paired with the second generation of Audi’s Cockpit and a clean, bright HUD, the resulting cabin space is one that works to make your commute as simple or complex as you’d like. Turn off the items you don’t need, put the car in Dynamic, and rip along your favorite backroad. Or, yell out some voice commands, write a search term with your finger, and shuttle off to find the nearest FroYo joint. The seats are comfortable. That B&O sound system cranks. And you can charge your actual smartphone wirelessly, while it’s also wirelessly connected to Apple CarPlay. For those that have to sit in the rear, full-size adults will have no issue as Audi didn’t cut that roofline too sharply to interfere with headroom. Since this is still the Q7's wheelbase, minus one row of seating, there’s ample space inside. You have plenty of room for your newly Marie Kondo-condensed junk, especially when you fold that second row down flat. So Audi is clearly reaching for maximum acreage in a war of frontage fought alongside the likes of BMW, Chevrolet and Lexus. This is a stylish machine from most angles. The direct head-on view is not one of them. You also notice the Q8’s weight when you’re driving it. Not all the time, mind you, but when you’re stuck behind a semi-truck on the highway and you finally hit that passing zone. Even in Dynamic mode, the engine and transmission need a second to get moving. Downshift. Downshift. A moment of seeming momentum pause followed by “oh my god... oncoming traffic is closing in” and then you’re zipping off and around those in front of you. A bit more juice under the hood definitely wouldn’t hurt in situations like that. There’s also the issue of price. These start just under $70,000. The Premium (read: Base) is $68,395. You can option them up into the $80,000-range, but the average Q8 should fall in the mid $70s. Considering Audi is targeting the likes of potential Range Rover Sport, Porsche Cayenne, BMW X5 and X6, Mercedes-Benz GLE and GLE Coupe buyers, that price point actually suits the vehicle. But I’m not sure that it feels like a $70,000+ sporty crossover, without a potent V8 lurking under hood. The Porsche fits the bill, and so does the Range Rover, but one of those will nickel and dime you on the ordering guide and the other blends in with the crowd parked outside of Whole Foods. And both will wind up costing a lot more than the Q8, once you’ve tallied up your optional extras. The 2019 Audi Q8 is the option for someone who loves the four-ringed brand, likes a little extra room and ride height and wants to be at the forefront of its styling direction. This is a crossover that is actually sporty enough to make you smile on a twisty road, yet it’s also civil and luxurious enough on the inside to impress your friends and family. The fact that Audi isn’t attempting to call it the Q7 Coupe is also another point in its favor. Is it sporty enough? That’s a harder question to answer. I enjoyed the hundreds of miles I logged over a wide range of terrain types. Yet I couldn’t help but wonder what an SQ8 might look, feel, and sound like. After all, this is the same platform upon which the monstrous Lamborghini Urus and hilariously fast Bentley Bentayga ride. Ditch the 3.0-liter V6 for that wonderful 4.0-liter twin-turbocharged V8, and we have a serious performance machine with actual rally-inspired style. At least, the sort prepared for this crossover-obsessed universe. For now though, your best bet is to drive a Q8 and then take a spin in the SQ5. If you don’t need as much space or electronic interior greatness, the SQ5 is a blast to drive. For those seeking the latest and greatest in cockpit cool, you’re likely to gravitate toward the Q8. And that’s not a bad thing, when you consider where the Q8 gets it style from. This is the modern Ur Quattro made for our crossover-crazed world. It’s happy sliding along gravel roads, even if it’s more likely to be found plodding along a strip-mall parking lot. Top-tier interor tech and entertaining driving dynamics. The head-on view is tough, and we're left waiting for the SQ8 version for more juice. Surprisingly good dynamically, comfortable at every seat, but a bit more power would be nice.